If you've lived in Michigan for any length of time, you've probably heard about the Edmund Fitzgerald. It sank 40 years ago. For many, the story is still fascinating to hear. EDITOR'S NOTE: This story originally ran Nov. 10, 2015. The Great Lakes have claimed thousands of ships since European explorers began navigating the waters in the 1600s, but few have captured the public's imagination as has the Edmund Fitzgerald, which sank 43 years ago on Nov. 10, 1975, in Lake Superior. Much of that attention is owed to Gordon Lightfoot's haunting ballad, "The Wreck of the Edmund Fitzgerald," which memorialized the ship and its crew members, whose bodies remain with the sunken vessel. "Lake Superior seldom coughs up her victims unless they're wearing life jackets. As of this time, we have no reason to believe the men of the Fitzgerald had time to get into life jackets," Capt. Charles A. Millradt, commander of the Soo Coast Guard Station, said at the time. Nothing so tragic has occurred on the Great Lakes since. "So, what ever happened, happened very quickly and it was catastrophic", says Jim Spurr who is an avid sailor and maritime historian. Out of all the shipwrecks on the Great lakes, he says this is talked about the most. "That they could encounter hurricane force winds and send her to the bottom with so little warning." It was November 10, 1975. The Edmund Fitzgerald was in route to Detroit via Lake Superior. A storm with hurricane force winds moved through. "They stuck along the north side of the lake trying to shield themselves but then headed south to the Caribou islands." The ships radar went out. "Essentially she was sailing blind." The freighter sank just after 7 p.m. 29 men lost their lives. The cause of the wreck has been debated for years. The official report blames human error due to the hatches not being properly batted-down. 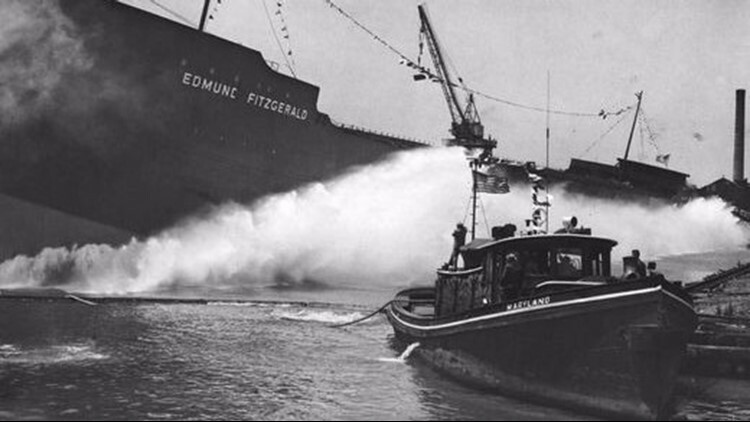 The SS Edmund Fitzgerald is launched in River Rouge on June 7, 1958. "I don't think there is any real evidence they didn't do that. It's not persuasive to me", says Spurr who works as an attorney. Spurr thinks the ship, without radar, sailed too close to the Caribou Islands. "Now if she struck the shoals within that amount of distance, she could have lost sufficient buoyancy to go down." Some would say the events that day were part of a perfect storm. You can have an experienced crew and modern technology, but you can't control the weather. For that reason, Spurr believes it could happen again. "Disasters at sea are so often the culmination of a string of little things which are inconsequential. But when combined in the proper sequence can cause catastrophe." Spurr will be hosting a presentation at the South Haven Maritime Museum at 7pm called "The Gales of November". He will be talking about several Great Lakes shipwrecks and showing video of the Edmund Fitzgerald, as it sits at the bottom of Lake Superior.